Make a run on R&D. If successful, you may make another run on R&D when this run ends. If the second run is successful, gain 4credit. When does the Runner gain credits from Möbius? The Runner gains 4 from Möbius as soon as the second run is considered to be successful. This card seems quite strong in a vacuum, but much like Dirty Laundry you need to be using it for the right things or the utility will be marginal at best. If for example you just use it to hit an undefended R&D, it's a 4 credit econ card (free Sure Gamble!) plus MAYBE a double access if you can trash the first card or it's an Agenda you can steal. This isn't bad! However, if this is the only reason you're running it then you'll run into trouble when R&D is ICEd up and you draw it and it's not worth paying the tax for the second run even with the 4 credits because odds are you'll just see the same card again. This means you want to run it with other R&D attack cards, probably. The obvious star is Medium, which not only gives you an extra accessed card on your second run but ALSO gets an extra counter when that run succeeds! If your deck is built around spamming Medium runs on a single turn, Möbius is essentially 0 credits for a bonus click and 4 credits. That's pretty powerful. Indexing isn't bad either, since if the top two cards are both juicy and the server is undefended or thinly defended then this is then essentially a multiaccess with extra credits on top. The other, more Criminal option is to run it with a bunch of ICE derezzing tools (Saker/Golden/Peregrine maybe, Crescentus, etc). Then re-enable the card late game by derezzing the R&D defenses and making the Corp too poor to rez them. Personally I don't think that strategy in general is currently strong enough to be prevalent as a primary plan of attack, but if it ever is (or if I've underestimated it!) this card might be decent econ in such a deck. My final commentary is that I think the strongest use of this card is imported into Edward Kim: Humanity's Hammer running Medium. Ed already plays well with Medium since he essentially gets to see an extra card by trashing the first R&D Operation he sees, and in addition to the Medium synergy mentioned above a turn 1 Möbius is a lot stronger on him since seeing an Operation on top of R&D lets you smash it and try again instead of making the second run just for the credits. Plus it's only 1 influence, which makes this far less painful to do. This isn't, at first glance, the best card. "Click to gain 4" is a great sell, but the buy in is "run R&D twice", which is much worse than Sure Gamble just requiring 5 creds. But assessing cards is more complicated than that, and you can't just consider them in a vacuum. In particular, you have to consider Mobius in light of Medium. Medium is the single most common win condition in the game, and all it wants is you to run R&D over and over until you win the game. This card rewards you for doing that, so that's obviously good, but wait there's more. 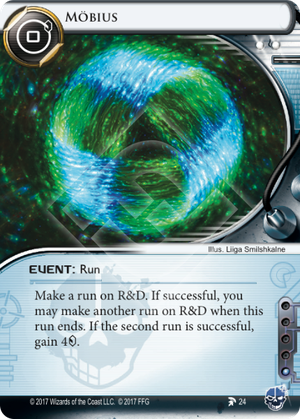 Once you twist your mind to where running R&D isn't cost of getting the Mobius credits, but is something you do for its own sake (or to grow Medium), then the card's second facet shines through. It gives you 2 runs in one click. So long as all you want to do is run R&D (thanks Medium), that's basically extra clicks. A card that says "Gain a click and 4 creds" is absolutely insane. If you can ever engineer a situation where you have a medium and R&D is open, then this card is absolute gold. Conclusion: While not incredibly strong on its own, Mobius feeds into the game's best plan (ice destruction to open R&D, medium to victory), and this card has just one influence. I predict it will see play as a 3 of in a lot of red decks.